Mikey York went three scoreless innings to earn the win Sunday. PORT CHARLOTTE, Fla. (April 7, 2019) - Jake Palomaki drove in the winning run with a single to left field in the tenth inning Sunday, leading the Charlotte Stone Crabs to a 2-1 win over the Fort Myers Miracle in ten innings at Charlotte Sports Park. In a 1-1 game in the bottom of the tenth, Tyler Frank pinch ran as the automatic runner at second. 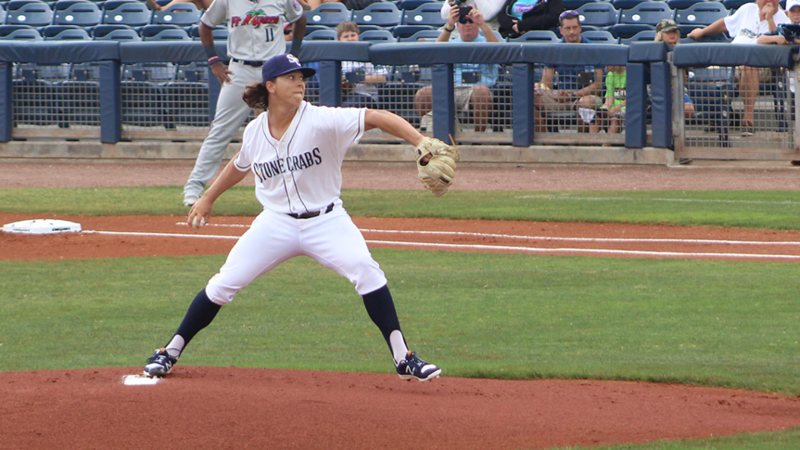 After Stone Crabs (2-2) third baseman Jim Haley advanced Frank to third on a groundout, Zac Law struck out. With two outs and Frank at third, Palomaki lined a single to left to score Frank and earn a series split with Fort Myers (2-2). Prior to the tenth inning rally, neither team had scored since the third inning. Miracle pitching struck out 19 Stone Crabs, but Charlotte persevered in extras. Stone Crabs right-hander Mikey York (1-0) earned the win, turning in three scoreless innings to keep the game tied. He struck out two and allowed only one hit. After Fort Myers scored on a Jose Miranda single in the first inning, the Stone Crabs answered back in the third. Vidal Brujan singled to third base to start the inning before he attempted to steal second. Miracle catcher Ryan Jeffers sailed the throw into center before Akil Baddoo misplayed the ball, allowing Brujan to score and tie the game at one. Charlotte starter Tobias Myers turned in five innings of one-run ball, allowing only three hits while striking out three. Righty Tanner Dodson delivered two scoreless innings of relief, pitching out of a jam in the seventh. The Stone Crabs will start a four-game series with the Bradenton Marauders at 6:30 p.m. on Monday. Paul Campbell makes the start for Charlotte against Cody Bolton of Bradenton. Coverage begins at 6:15 p.m. on the Stone Crabs Baseball Network.